Each frame is .1 seconds apart. Oussama Melloulli's time for this event was 14:37.28. In this sequence, the swimmer is kicking more vigorously than in earlier stages of the race. It appears that his kicking increased over the last 100 m of the event. This is a left-side breathing stroke. Frame #1: The right arm has entered. The left arm adducts leaving the hand/forearm as the propelling surface. The left leg kicks to counterbalance the right-arm entry. The head is rising, and is causing considerable turbulence off the face. Frame #2: The left arm continues to propel and appears to be at the end of adduction. The head is turning to the left. Frame #3: The right arm remains fully extended forward. The left arm begins to exit. The mouth is clear of the bow wave pocket. The right foot performs a small kick to counterbalance the exiting left arm. Frame #4: The right arm remains fully extended forward and marks the beginning of a considerable inertial lag. The left arm has exited. The read remains to the side. The right leg prepares to kick. Frame #5: The left arm recovery continues. The left leg kicks to counterbalance the lateral forces developed by the recovering left arm. Frame #6: The right arm continues in inertial lag. The left leg drags to counterbalance the recovering left arm. The right leg prepares to kick. Inhalation is complete and the head begins to return. Frame #7: The right arm presses directly down through abduction of the upper arm to counterbalance the entering left arm and the returning head. The right leg begins to kick. Frame #8: The right arm begins to apply propulsive forces, marking the end of an inertial lag of approximately half a second. The right leg kicks to counterbalance the entry of the left arm. The head looks forward and generates considerable turbulence. Frames #9 through #12: The right are propels the swimmer while the left arm is "parked" in front. At the end, the left leg kicks to counterbalance the exiting right arm. The amount of turbulence streaming off the face and down the trunk is alarming. Over 1,500 m, that resistance would add a considerable amount of time. 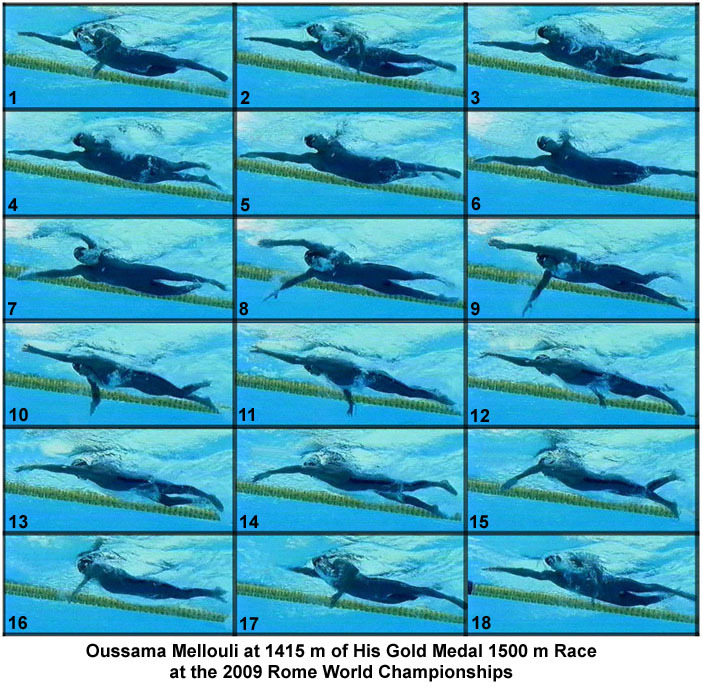 Frames #13 through #16: As soon as the right arm completes propulsion, the left arm begins to be repositioned (Frames #13 and #14) and then propels the swimmer forward, while the right arm recovers. This synchrony is very different to what happened with the left arm recovery. Frames #17 and #18: The right arm enters as the left arm continues propulsion. The head turns to the side to initiate the breathing action. How much breathing to the left extended the right-side inertial lag can only be estimated. But, compared to the left side pull, which began very soon after the right arm finished propulsion, it probably played a considerable role. As has been seen with most male distance swimmers, the skill of breathing quickly with minimal resistance is an action that needs to be revived. It is no wonder that male distance swimming records are not improving. So much time is spent in inertial lags in top swimmers. When a swimmer emerges and applies force more consistently, the next drop in distance swimming records for men is likely to occur.